Bali is blessed with so many beautiful beaches around its island. It seems like every coastline in Bali is amazing and captivating. Of course not all beaches are famous, however some of these infamous beaches have a stunning beauty and unique characteristics that the others don’t have. One of these beaches is Kusamba Beach which is located in Kusamba Village, Dawan District, Klungkung Regency. 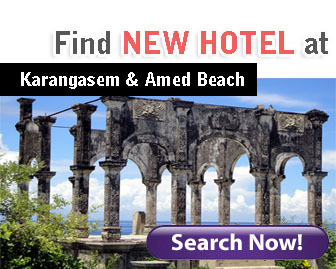 This beach is approximately 7 km eastern of Semarapura Town; the capital of Klungkung. If you want to visit this beach you will need around 90 minute drive from Ngurah Rai International Airport, or take around 29 km route. Kusamba Beach is surely amazing with shiny black sand and beautiful panorama also completed with natural and peaceful ambience. You will be able to see colorful boats decorating the beach line which are the property of the people from a fisherman village around here. This beach is quite popular for its persistent fishermen and its traditional sea salt farming. The fishermen and salt farmers here are still sticking to their inherited tradition for catching fish and creating salt. By promoting this beach as one of the tourism object in Klungkung, the local government hopes that the economy of this region can be raised. Tourists who come to this beach can directly observe the fishermen’s activities on the sea and sea salt farmers’ farming process right on the shore. Early in the morning, the salt farmers have already started their farming activity. 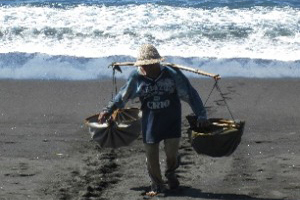 By using teku, some kind of sea water container made of palm stem, they walk down the beach to take sea water. After the teku is full, the sea water is splashed over the prepared sand area. They walk on the sand while shaking the teku-teku they carry on their shoulder. This process is repeated until all the area is wet by the sea water. Weather is an important factor in the process of traditional salt farming. The brighter the sun, the better the result will be. The heat of the sun will make the wet sand mixed well with the sea water. The catchment water which is already mixed well with the sand is then gathered in a bamboo container. The catchment water will drip from the bamboo into the prepared container. There are 2 containers with simple filtering system for the water. After that, these water will be dried under the sun to get the salt crystals. Besides fishing and salt farming, the people in Kusamba also do side jobs like ferrying daily needs like rice, seeds, or fruits to Nusa Penida, a deserted island across of Bali. Using big boat, they can deliver up to 1.5 ton goods to Nusa Penida. Besides that, they can also reach Nusa Lembongan, a small island near Nusa Penida. They usually cross from Banjar Tri Buanan Beach, Banjar Bias Beach, Kampung Islam Beach, with crossing time around 30 minutes until 2 hours depending on the boat that they use. Not just that, these boats can also carry the tourists who want to snorkeling and diving in those islands. Segara Beach in Kusumba is also quite interesting because this beach is often used as traditional ritual place like nganyut which is still the series of ngaben ceremony. Besides that, around this beach there is also a fish market where various fresh fish with low prices can be gotten. If you want to visit this fish market, you must go here between 10.00 am until 4 pm. Actually, there is no particular naming history of this beach. It was named Kusamba Beach just because this beach is located in Kusamba Village. However, if it is related to history, this beach has recorded as one historical place in the Indonesian Independence War. In 23 – 24 of May 1849he , Balinese troops were able to defeat Dutch armies. Moreover, Dutch important officer at that time, Lieutenant General Michiel was killed by the brave Balinese troops. If you want to visit this beach you don’t need to worry because some public facilities for tourists have already built, such as restaurants, food stalls, parking area and boat rental for tourists who want to visit the other nearest islands. Kusamba Beach can be a good alternative if you are bored by the crowd of the other beaches in Bali. This beach offers tranquility, peaceful environment, and beautiful panorama for its visitors.